Introducing a lined version of the Nordwand jacket. If you are out on mountain tours, ski tours or climbing expeditions in cold and wet conditions as well as on “bluebird” days, Mammut's Nordwand HS Thermo Hooded Jacket will soon be your essential companion. 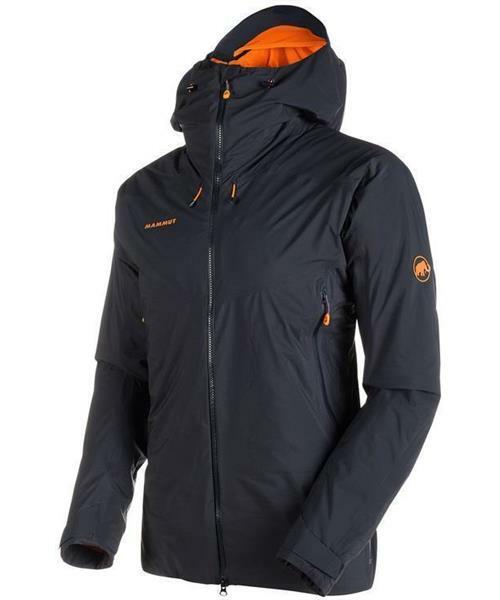 It features the same revolutionary cut with the Mammut Vertical Motion Construction™ and Mammut High Reach Technology™ as the Nordwand Pro HS Hooded Jacket, but the outer material is a waterproof and very breathable Pertex Shield Pro®. To make sure the Nordwand HS Thermo keeps you warm as well as absolutely dry, it is filled with PrimaLoft® Active Gold insulation. When it comes to technical features, the Nordwand HS Thermo has no need to fear comparison with unlined hard shells. It is waterproof, has climbing harness-compatible external pockets, Mammut High Visibility BackerTM for greater visibility and a helmet-compatible storm hood. Once you put it on, the Nordwand HS Thermo Jacket will accompany you all day long in cold conditions.